Cabinet Finishes: Factory, Small Shop, or Job Site? Hi, Jim Coshow here with Dunn Lumber. Today we're welcoming Cindy Draper back to the Dunn Solutions blog to offer her insight about the cabinet finishing process. Cindy is a marketing manager for Canyon Creek Cabinet Company, a recognized leader in the kitchen and bathroom cabinet industry. Dunn Lumber is proud to offer fully customizable cabinets by Canyon Creek. Here's Cindy. When planning your new kitchen or remodel, the look and durability of your cabinet’s finish is an important consideration—it's one of the first features you notice and is indicative of the quality of the cabinetry. You want to have a strong, smooth surface to the touch, without the inconvenience of having to maintain the finish every few years. Before you purchase your cabinets, you should ask your designer, contractor, or cabinetmaker if the cabinets will be finished at the factory of the cabinet manufacturer, in the cabinetmaker’s shop, or on the job site. Here are some key differences between these three options. A factory-applied finish is a multi-step process that starts with select grades of wood and ends in a state-of-the-art finish area, where multiple sealer coats are applied after each stain application. These sealer coats are applied to each door, drawer front, and cabinet. The finish area is a controlled environment that is kept dust-free by a dust collection system that constantly pushes air out through filters and recycles in clean air. Most small cabinet shops cannot afford this type of dust control system—nor have the space for one—and it's not possible with a job site finish application. Spraying the cabinets on site actually stirs up the air and dust during the application of the finish. Because wood is a natural resource that will expand as it gains moisture and shrink as moisture is lost, it's important to avoid moisture-related problems by storing wood products in a climate-controlled facility. The temperature should be maintained within a range of 60°F to 90°F, with relative humidity in the range of 40 percent to 50 percent. Catalyzed sealer and topcoats are important, because they are what make the finish durable, scratch-resistant, and impervious to most household cleaners. Part of the factory-applied finish is the application of three sealer coats between each stain application. 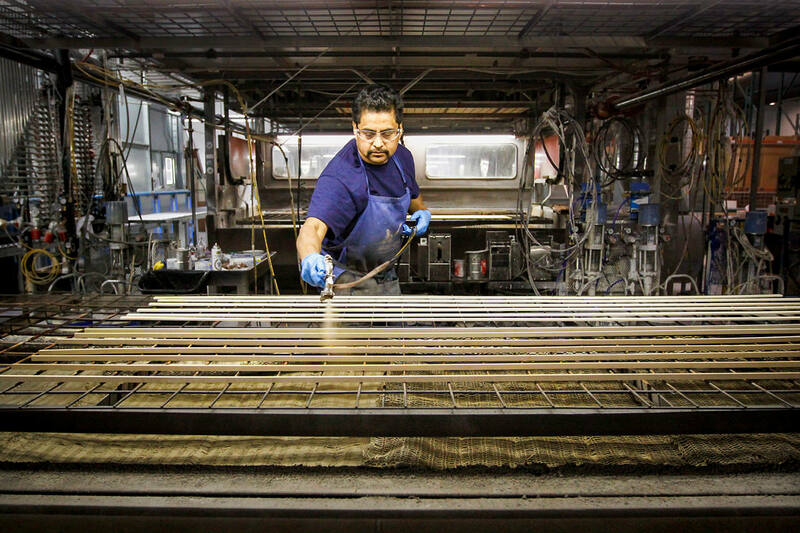 Factories add the critical step of drying between layers of finish materials; they use large ovens with high-powered lights to bake the finish and accelerate the drying process. Drying before the application of the next coating assures maximum adhesion so the finish sticks. Most small cabinet shops and on-site finishers don't have expensive equipment or a fluid delivery system. 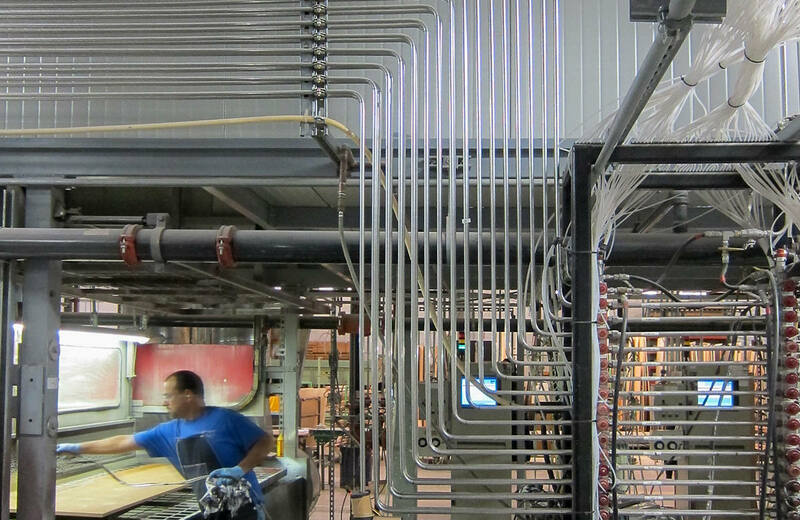 These systems use paint guns to draw paint from a central paint "kitchen" to deliver stains and topcoats onto the product through stainless steel lines. Most small cabinet shops and on-site finishers also do not have the space required to allow for this application process (or space for the product to cure). Since their options are limited, most local cabinet shops and job site finishes contain polyurethane or a lacquer topcoat, which doesn’t have the same durability as a catalyzed finish. Without mixing or catalyzing finish materials, the finish has to be cured or dried by evaporation. It's nearly impossible to duplicate the durability and lasting beauty of a catalyzed conversion varnish outside the controlled environment of a cabinet manufacturer’s facility. The finish process is vital to ensuring the durability of your cabinetry. Most cabinet manufacturers offer a lifetime warranty on their products because they are confident that the factory-applied catalyzed varnish finish will last and look great for many years to come. As Seattle’s historic homes continue to age, they will require the expertise and experience of a knowledgeable master craftsman in order to maintain their historic and monetary value. This is part one of two in a series showing window restoration at Seattle's historic Moana Apartments.